Built in the style of a five story hunting lodge, the Parador Cervera de Pisuerga is in the foothills of the Picos de Europa. The views are of the Ruesga reservoir and the distant mountains of the Natural Park of Fuentes Carrionas. The decor captures the spirit of the hunting lodge with wood panelled walls decorated with mounted heads of wild animals. Colour is provided by brightly painted ceramics. The bedrooms are very spacious and comfortable with balconies from which the view can be enjoyed. The restaurant windows have beautiful views of the Ruesga reservoir. The interior panelled walls are decorated with paintings of tempting foods. In the town visit the fortified church of Santa Maria del Castillo sitting on top of a hillock in the town. Inside there are delightful peaceful cloisters. Also in the town is an ethnographic museum which is worth a visit. It is worth exploring the small villages in the area and the Natural Park. It is an area rich in wild orchids and butterflies. A car trip a little further brings to the dramatic mountains of the Picos de Europa where there are many paths waiting to be discovered. For the less energetic there are peaceful walks alongside the lakes in the area. 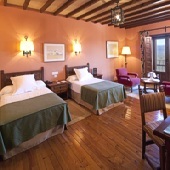 The Cervera de Pisuerga Parador has seventy two twin bedded rooms, eight rooms with a double bed and eight single rooms. All bedrooms have a private bathroom and a telephone, satellite television, and a mini bar. 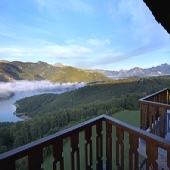 The Parador of Cervera de Pisuerga has central heating, parking facilities (without security and limited places), safe available in the reception, currency exchange, lift, satellite television, garden, wireless internet, children's play area, restaurant and bar. There are facilities to hold small conferences. Distance from the nearest airport is approximately 132 kms, train station is 24 kms away and the nearest port is 132 kms away. We always stay here on the way to and from our house in Portugal. An excellent Parador one of the best. 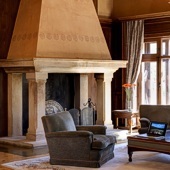 The staff are helpful and friendly, the rooms and view splendid. The food especially breakfast is good and the restaurant manager first class. We stayed here for two nights half board and found the staff friendly and helpful. The room was first class and the view magnificent. The scenery around the hotel was superb and despite less than ideal weather we enjoyed drives through the surrounding countryside with its lakes, mountains and flora. The food was first class both for breakfast and dinner and the staff attentive. All in all a most enjoyable stay. Stayed in the parador in September. This was our first stay and we weren't surprised at the high standard of hospitality we received. The view from the terrace was quite superb and just what was needed after an over-night crossing. As we regularly stay at paradors, on our way through Spain, this like all the rest was very good value for money, with excellent accommodation and good food, certainly one we would visit again. 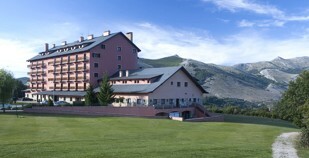 Parador de Cervera de Pisuerga is a hotel overlooking the Ruesgo reservoir.